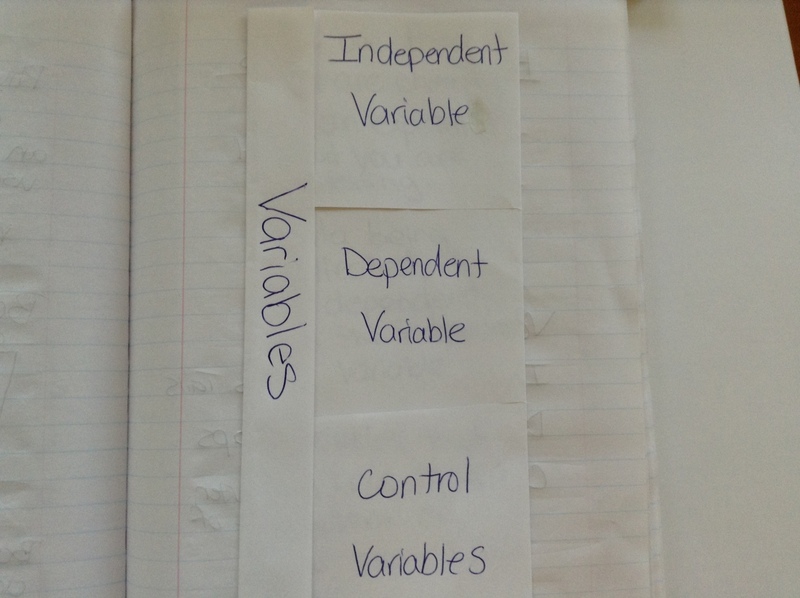 SWBAT differentiate between dependent, independent, and control variables as well as identify each in a given experiment. Students become contestants on the game "Can You Name That Variable" to test their knowledge about variables. Students must be able to identify variables in experiments as outlined by standard 3-5-ETS1-3 which states that students will plan and carry out fair tests in which variables are controlled and failure points are considered to identify aspects of a model or prototype that can be improved. In order to complete these tests failry, students will need to know how to control all types of variables and thus, mut have a good understanding of what each type of variable is. In every experiment we conduct throughout the year, identifying all three types of variables will be an important aspect. Providing them with many opportunities to practice identifying these in real experiments will help build their knowledge and confidence. Hotdog fold a piece of copy paper and cut the front flap into 3 sections to make a foldable for each student. I always precut the foldables for students to save time. Print out the what is wrong in this experiment scenario to use on the overhead. Download the Can you Name That Variable game. Can you find what is wrong with this experiment? I place the what is wrong with this experiment scenario on the overhead. The scenario is being used to engage students in a discussion that leads into what they will be learning about today, variables. Students read through it and I ask them to turn and talk with their group members to try and find what the girl in the scenario and her mother did wrong. I circulate and listen to conversations. After a couple minutes of talk time, I call on groups I heard that had different ideas. One group said they only tested the experiment one time and they should have done it at least three times. Another group identified the different amounts of water being used as what was wrong. A third group said they only added salt to one of the pots. We discuss these ideas together as a class and determine if we believe they could affect the outcome of the experiment. I do not tell them the correct answer at this time. I pass out a foldable, which is precut as described in the preparation section, to each student. I explain that in order to accurately test something in an experiment, scientists have to control variables. 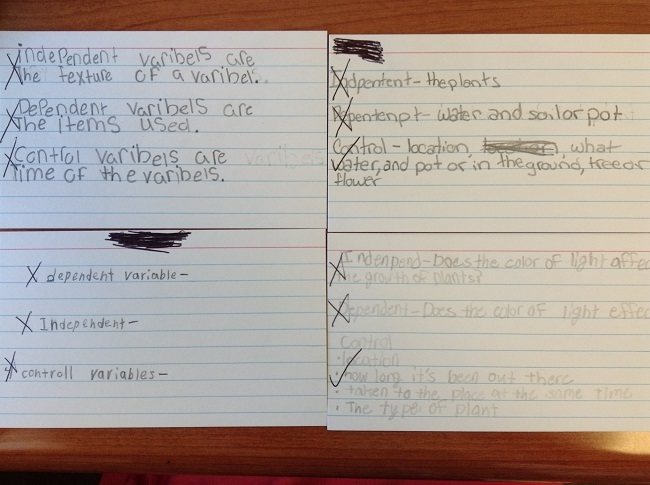 There are three types of variables that we will be identifying and discussing. I have a foldable I am recording on as I discuss these variables. The foldable I am recording on is projected on the overhead. I do this so that ESE and ELL students, as well as those who may struggle with listening and writing, will have a model to refer to. It also allows for me to have a copy in my science notebook to refer back to throughout the year. I ask students if they know what the word independent means. They begin giving me answers that indicate they may know, but cannot put it into words. I use the word in a sentence “tests are to be completed independently” and ask them what the word means in that sentence. They can then tell me it means to be completed alone. I tell them that an independent variable is similar, it stands alone. The independent variable is the one variable that is changed. Only one variable can be changed in an experiment so that we know that is the variable that affected the outcome. We open the independent variable flap and record: The one variable that is changed or is being tested in an experiment. I then tell them everything else in the experiment has to be kept the same, and everything the scientist has control over are called control variables, or constants. We open the control variable flap and record: all variables in the experiment that are kept the same, can usually find at least 4. Our final flap is the dependent variable flap. I tell them that the dependent variable is dependent on the variable that is changed…which is the (I wait for choral response of independent variable). I always remember the dependent variable as the data since both begin with the letter D it makes it easier to remember. We open the dependent variable flap and record: the dependent variable is the data being collected, it is dependent on the independent variable. I put the what is wrong with this experiment scenario back on the overhead so we can go over it together. I read it aloud the students. I ask them to identify the independent variable, or what Stephanie is testing. They answer correctly by stating she is adding salt to the water. I highlight this in yellow so it stands out as the independent variable. I then ask them what the dependent variable is or what data she is collecting or measuring. They can answer correctly, the time it takes the water to boil over. I highlight this in green so it stands out as the dependent variable. I then ask them to identify at least four things that Stephanie and her mother would need to control, or keep the same, so that they will know it is the salt that has affected the outcome. This presents more of a struggle for students. I have them visualize what Stephanie is doing. I have a student read the second paragraph and ask students what variables they see in that paragraph, they answer the amount of water, the size of the pot, and the temperature of the stove. I highlight these in orange as they name them. They cannot name a fourth without some question leads from me. I go through and physically act out the experiment, pointing out the variables they have already identified. Stephanie walks over to the cabinet, she gets 2 identical pots out and adds water to both. She pours salt into one of the pots and then walks over to the stove and places them on the burners. Think about what your stove at home looks like. Is there anything Stephanie would need to consider when placing the pots on the stove? What is she doing with the pots after she puts the heat on both at the same temperature? Students respond to my questions by first saying that Stephanie would need to put the pots on the same burner. I correct them by saying, they can't put two pots on the same burner, but they can put them on burners of the same size. Another student tells me that she would need to watch them and time to see which one boils over first. I ask if she is doing anything while she is timing and they say no. I say, exactly, that is another variable. She can't be stirring one pot, or shaking it, they should both be sitting still. I then ask them the question presented in the warm up again, “Can you see what they did wrong now?” Students can tell me that they used different amounts of water which could have affected to outcome. I take out a scientific method trifold board with the steps of an experiment on the board and students take out their whiteboards. I use one of the experiment example sets from the scientific method lesson (experiment practice strips set 1, experiment practice strips set 2, experiment practice strips set 3 ). I ask them to decide what the independent variable in the experiment is. I remind them, this is the one thing that is being tested or changed in the experiment. 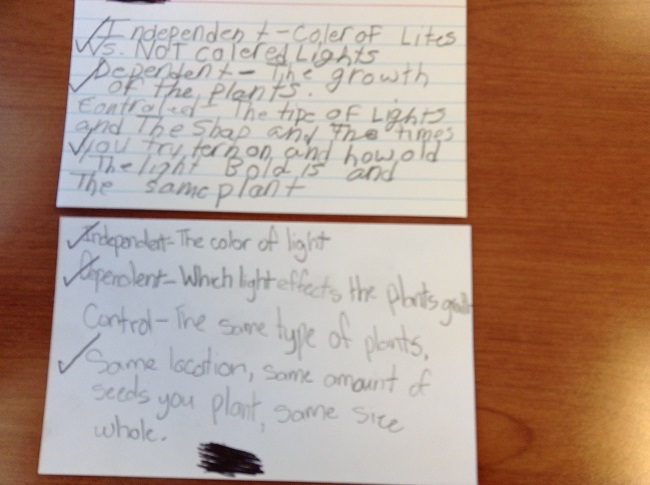 Students record answers on their whiteboards and hold them up. I then ask them what step they found this information. The majority of the time, the independent variable can be found in the question. I then ask them what the dependent variable would be, and remind them this would be the data that is collected. Students record their answer on their whiteboards and hold them up. I scan the room to see which students demonstrate an understanding and which students are struggling. I will direct questions towards these struggling students to help them visualize the experiment and what will be measured. I ask students what step this information can be found. They can usually find what data will be collected in the procedure. I then ask them to discuss with their group and record on their whiteboards, four variables that would need to remain constant, or kept the same in this experiment. I give them a few minutes of talk time and time to record, then ask them to hold their boards up. I read off what each group put and we see that the class was able to come up with more than just four. I have included answer keys, experiment practice strips set 1 - variable answer key, experiment practice strips set 2 - variable answer key, experiment practice strips set 3 - variable answer key with the variables identified to help know what I was looking for. I highlighted the independent variable in each set yellow, the dependent variable in purple, and the control variables in blue. The highlighting helps to see where these can most often be found. 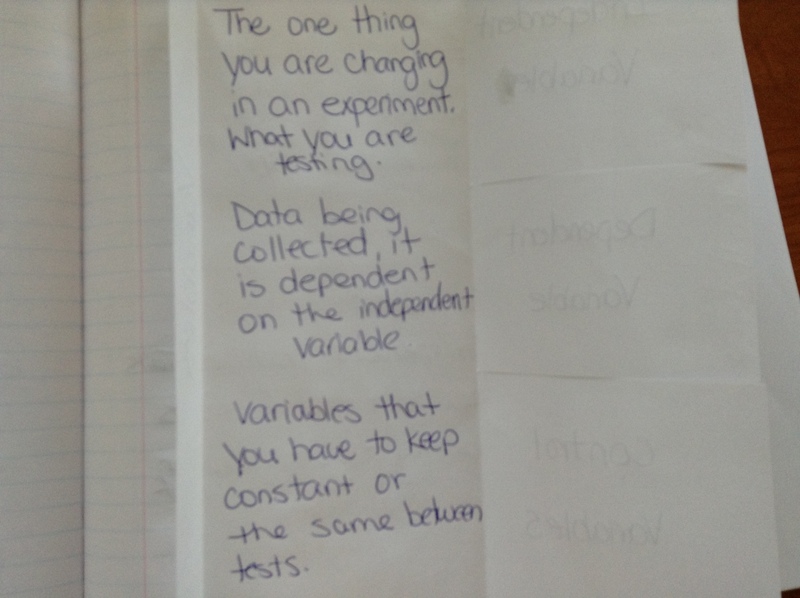 Control variables are the most difficult thing to identify because they are not always listed in the experiment steps, sometimes students have to infer what these variables might be. I included several possibilities for each experiment, including those not listed in the experiment set up, at the bottom of each document, along with the other variables written out again. Group 1 will go first, they will select a category and amount. I will reveal the question, all groups will discuss their answer at a voice level 1 (whisper). I remind them if they are louder than a voice level 1, other groups will hear their answer. I tell them that the recorder will write the answer on the white board and keep it hidden until I ask for boards up. When I say boards up, all groups must hold their boards up so I can check answers. Any group that does not put their board up immediately will not count. I award points, and the next group selects a category and amount. The group with the most points at the end wins. I remind the groups that my expectation is for all students to be active participants, and if I see any student not participating in the discussions, they will be moved to their own group. I also remind them that they should be rotating the board around to a new recorder after each answer. We begin the Can You Name That Variable game. Video of Students playing variable game listing control variables for experiment "can you jump higher with high top shoes or low top shoes". I was very pleased to see all students actively engaged in the game. They enjoy playing academic games and work well in groups during these activities. They did have a very difficult time with control variables, and with the "Name that Variable" section of the game. We will continue to play this game periodically throughout the year to review. After announcing the winner of the game show, I award them with a prize and ask a student to pass out an index card to each student. I reveal the final slide of the game which is an exit ticket problem. 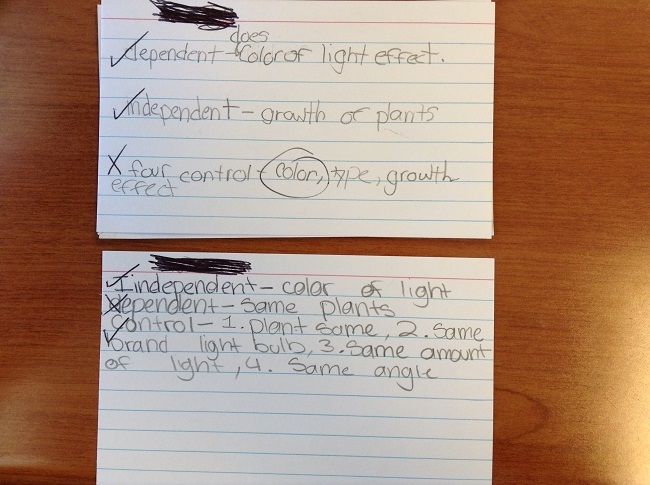 I remind students to write their name on their index card and then identify all three types of variables for the given experiment.